2D freehand animation enables viewers to intuitively experience artistry and feeling. Among these techniques, GIF animation (e.g., LINE’s stamp and Twitter icon) has attracted worldwide attention in social networks. To present a worldview using 2D freehand animation, anime-like techniques such as flip books and motion comics are employed. However, the creation of 2D freehand animations has always been a time-consuming and skill-demanding process. Software such as Adobe Photoshop provides some assistance by creating animations from a small number of key frames and generating in-between frames automatically. However, creating the numerous key frames of animation, such as those in a flip book, requires significant skill and time. 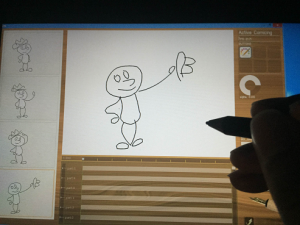 Therefore, our project develops a sketching interface that provides enhanced frame interpolation capability for freehand drawing animation (i.e., graffiti animation). 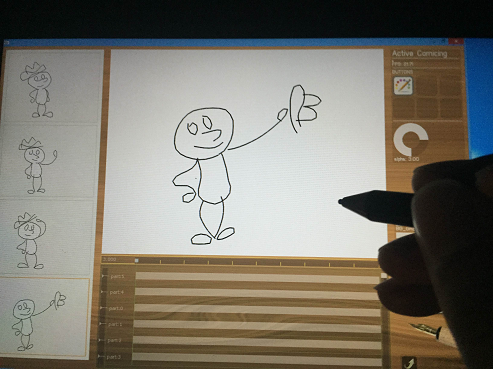 With our interface, the user can generate freehand animations easily and quickly.